College of Education and Human Services has raised $ 20,101 from 84 gifts! Higher education is increasingly competitive, and the need to sustain Mountaineer excellence has never been more important. Our greatest needs include support for student scholarships, research projects, building and technology enhancements, as well as specific needs for each of our five departments. The funds listed need your support, but with the ever-increasing need for private philanthropic giving, a gift supporting the College, or one of our five distinguished departments will be greatly appreciated. The CEHS Dean's Greatest Needs Fund assists the College with the greatest need at any given time. Annual gifts can support student travel to conferences, special programs and lectures for our students, and facility and technology upgrades. Created in partnership with the Morgantown Rotary in 2017, this fund was established to provide hearing aids to low-income clients of the WVU Hearing Center in honor of Dr. Hugh Lindsay. The CEHS General Scholarship Fund (2S160) awards financial support to students with financial need and academic promise. The opportunity to help defray a student's debt while they are pursuing their degree is truly appreciated. 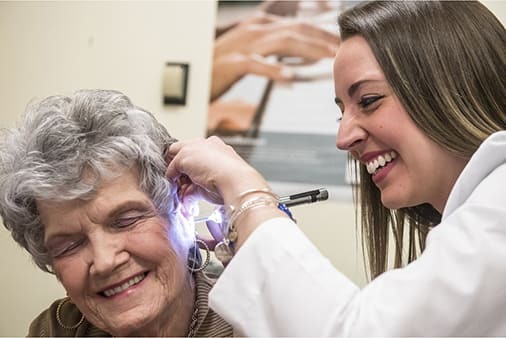 The Student Academy of Audiology (SAA)and the Rotary Club of Morgantown are partnering to offer a $4,200 match for donations to the Dr. Hugh Lindsay Hearing Aid Fund to provide hearing aids to clients of the Speech and Hearing Clinic at the College of Education and Human Services. Our Visiting Committee will generously match up to $2,606 to the CEHS Dean's Greatest Needs Fund. Christopher Owen is generously challenging all new donors to participate in Day of Giving 2018! If 10 first time donors donate today, it will unlock Christopher's $1,000 gift to the Dean's Greatest Needs Fund.